The Union home ministry has said the outfit was in “close touch with militant outfits” and involved in “anti-national and subversive activities”. 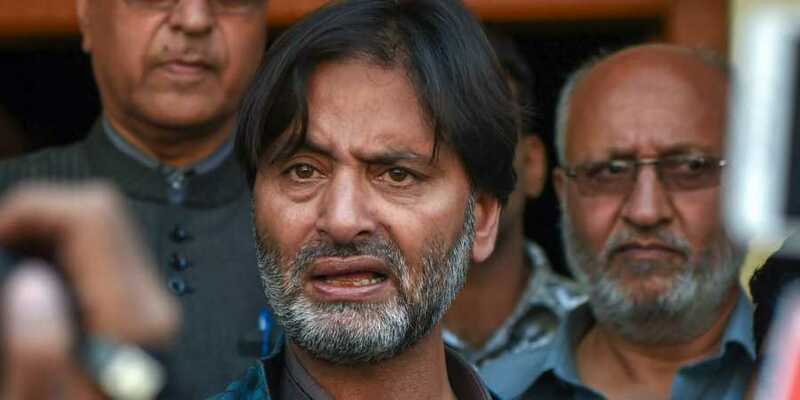 Srinagar: Exactly one month after separatist leader Muhammad Yasin Malik was arrested, the Centre on Friday (March 22) banned his party, the Jammu and Kashmir Liberation Front (JKLF), for “supporting extremism and militancy” and indulging in “anti-national activity”. The JKLF became the second party to be declared unlawful in Kashmir in less than a month, after religo-political organisation, Jama’at-e-Islamia, indicating that the Centre has decided to go after Valley-based separatist groups ahead of Lok Sabha polls which start on April 11. The Union home ministry banned the outfit for five years under the anti-terror law, on the grounds that it was in “close touch with militant outfits” and involved in “anti-national and subversive activities” intended to disrupt the sovereignty and territorial integrity of India. 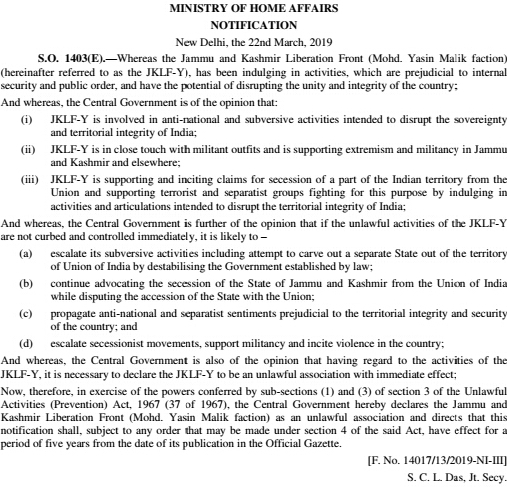 A notification issued by the ministry said that JKLF was “supporting and inciting claims” for secessionism and “supporting terrorist and separatist groups fighting for this purpose… by indulging in activities and articulation intended to disrupt territorial integrity of India”. Defending the move to ban the JKLF under the Unlawful Activities (Prevention) Act, the ministry said if the “unlawful activities” of the group were not curbed immediately, it was likely to “escalate secessionist movements and incite violence in the country”. In the wake of the ban, the JKLF leadership and members now face possible arrest and its offices could also come under the regulatory order. Malik has already been slapped with charges under the Public Safety Act (PSA) after his arrest on February 22, and is presently lodged in Jammu’s Kot Balwal Jail. The Union home ministry notification banning the JKLF. Aghast over the decision, all mainstream political parties in Kashmir hit out at the Centre, with the BJP’s ally in the previous government, Sajad Lone, saying that the decision would lead to shrinking space for peaceful dissent in J&K. “JKLF renounced violence in 90s. It was tantamount to suicide. At great risk Yasin Malik took the decision. And now stands banned,” Lone tweeted. Mehbooba Mufti reminded the Centre that Malik was treated as a stakeholder in the dialogue process initiated by former Prime Minister Atal Bihari Vajpayee. “What will a ban on his organisation achieve? Detrimental steps like these will turn Kash(mir) into an open prison,” she said. While denouncing the ban, Hurriyat leader Mirwaiz Umar Farooq said “such anti-Kashmir tactics” will not change the reality of the Kashmir issue, nor the urgency to resolve it. After the February 14 suicide car-bomb attack on a CRPF convoy at Lethpora, the government has continued to crack down on separatists and their alleged sympathisers. After banning Jama’at on February 28, the J&K police arrested its ameer (chief) Abdul Hamid Fayaz and have, according to the party, since arrested over 300 of its members. In addition, in the past fortnight, more than two dozen persons including Jama’at members have been slapped with the PSA and shifted to a Jammu jail. They include 20-year-old Aqib Gulzar from Anantnag, prominent Kashmir cleric and vice-president of Jamiat Ahlihadith Mushtaq Ahmad Bhat (Veeri) and a young man from Shopian with an MBA. While the arrests have continued, the National Investigation Agency issued summons to Mirwaiz earlier this month, asking him to present himself at the agency’s New Delhi headquarter for “examination” in a militancy funding case. Geelani’s son Naseem Geelani too has been summoned. Mirwaiz has, however, chosen not to travel to Delhi, citing “prevailing conditions of hostility” that pose a “threat to his personal safety”. In his paper ‘Movements in Protest: A Study of Jammu and Kashmir Liberation Front’, Farrukh Faheem, a Kashmiri scholar, writes that Amanullah Khan and Maqbool Bhat formed JKLF as an “offshoot” of the J&K Plebiscite Front in Pakistan-occupied Kashmir in the mid-1960s. While the party had negligible presence in Kashmir for more than a decade after that, it started to articulate a vision of an independent J&K in 1980s. That is when Malik, who had begun his journey as a young political activist, arrived on the scene. He was heading the Islamic Students League, a newly created youth movement, when the Muslim United Front decided to contest the 1987 elections against the National Conference-Congress alliance. The League announced its support to the MUF. Young Malik campaigned for MUF candidate Mohammad Yusuf Shah. But the elections were rigged and despite having won, Shah was declared to have lost and the National Conference-Congress alliance was declared the winner. Both Shah and Malik were jailed. Once out of jail, Shah crossed the LoC and would later become United Jehad Council chief Syed Salah-ud-Din. Malik was among the first few youth to cross the border for arms training. On his return, he along with three others, Hamid Sheikh, Ashfaq Majeed Wani and Javed Ahmad Mir, formed the ‘core group’ – HAJY. But it was on December 8, 1989 that JKLF came into the limelight when the outfit kidnapped Rubiya Sayeed, daughter of then Union home minister Mufti Muhammad Sayeed. She was released on December 13 in exchange for five militants. By then, Kashmiri youth were crossing the LoC in large numbers for arms training. The JKLF was their natural destination. As the armed rebellion swept Kashmir, Malik was arrested in August 1990. The following years saw the outfit’s militants either getting killed or captured, and the group gradually yielded space to the Hizbul Mujahideen, which strongly advocated the merger of Kashmir with Pakistan. Malik’s call for peaceful struggle was, however, unacceptable to Khan, who removed him as the president of the JKLF. In return, Malik expelled Khan from the chairmanship. In the letter, Malik talked about his meeting with then Prime Minister Manmohan Singh in February 2006. He also talked about his subsequent visits to the US and meetings with top White House officials, and later his parleys with then Pakistan prime minister, in his “efforts” to gather support for a Kashmir resolution. In 2007, Malik travelled across the length and breadth of Kashmir as part of his campaign ‘Safar-i-Aazadi (Journey of Freedom)’ to emphasise the need to include the people of J&K in the dialogue process. “I and my colleagues propagated peaceful struggle through this historic signature campaign…which resulted in historic transformation in 2008 when people of J&K as a nation transformed its struggle from a violent to a non-violent outlook,” Malik wrote. Married to Pakistani artist Mushaal Hussein Mullick, Malik has emerged as a key separatist leader in the Valley and has been at the centre of efforts for unity among Hurriyat leaders. Along with Syed Ali Shah Geelani and Mirwaiz, Malik is part of the grouping named Joint Resistance Leadership which has been issuing programmes since the 2016 uprising in Kashmir. Soon after Malik was arrested, the Central Bureau of Investigation approached the J&K high court seeking to shift the trial in two cases – kidnapping of Rubaiya Sayeed and killing of four Indian Air Force (IAF) personnel in Srinagar – in which Malik and others are accused to Jammu. The IAF case dates back to January 25, 1990, when militants gunned down Squadron Leader Ravi Khanna, Corporal D.B. Singh, Corporal Uday Shankar and Airman Azad Ahmad when over 40 IAF personnel were waiting for their morning bus at Rawalpora Chowk in Srinagar. The Srinagar wing of the court had in April 2009 stayed the trial in a designated TADA court in Jammu in both cases, and directed that proceedings before the trial court shall remain in abeyance. During the last hearing, the CBI informed the court that it has completed its investigation and submitted challans in both cases before the designated TADA court in 1990. Hearing the arguments from the CBI’s side, Chief Justice Gita Mittal on March 13 passed the order for transfer of the petitions to the Jammu wing of the court. “The records of the writ petitions would require to be forthwith sent to the Jammu wing… for hearing and decision,” Chief Justice Mittal said.